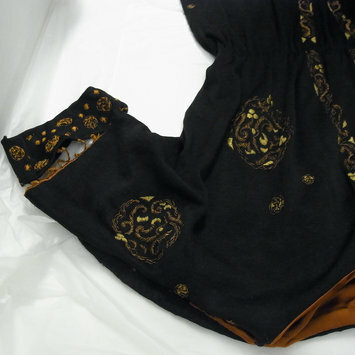 Dress made of black silk and rayon embroidered with Chinese-inspired motifs in bronze and gold which form bands around the neck, down the centre front and on the sleeves, and with circular forms scattered on the bodice, skirt and at the back hem. The neck is low and round and the sleeves are cut in one with the bodice. The cuffs are loose attached to the sleeves only with a series of twisted bronze silk threads. The bodice is loose fitting and gauged at the waist to the skirt, which, straight in the front, has a loose panel back which is gauged in at the hem and faced with bronze satin. Girdle of knotted gilt thread. The bodice is lined with black chiffon and the skirt with black silk. The dress fastens on the shoulder and along the sleeve with alternating press-studs and hooks and eyes. At the side is a hook and eye fastening plaquet. Grosgrain waistband with a printed label. COURT DRESSMAKERS, REVILLE & ROSSITER LTD., HANOVER SQUARE, W.